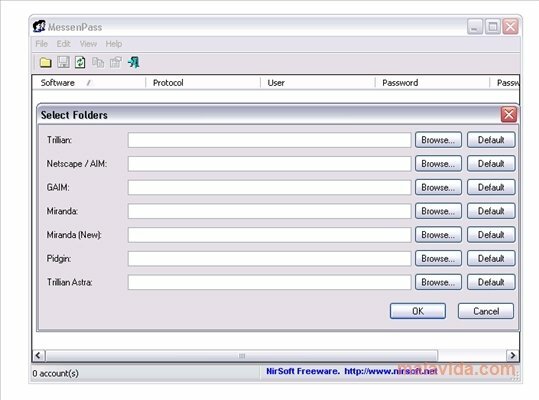 MessenPass is an application that has been developed to recover the passwords from various of the current instant messenger applications, such as MSN Messenger, Windows Live Messenger, Trillian, Trillian Astra, AIM, Pidgin or Miranda. The program automatically detects the Microsoft messaging client that is installed, the rest of compatible programs will have to be configured manually, so that they program can extract the passwords. Once it has analyzed the accounts that we use, it will show us a table with a series of results, in which we will be able to see the email address, the service used, the account password and the security level of the password. 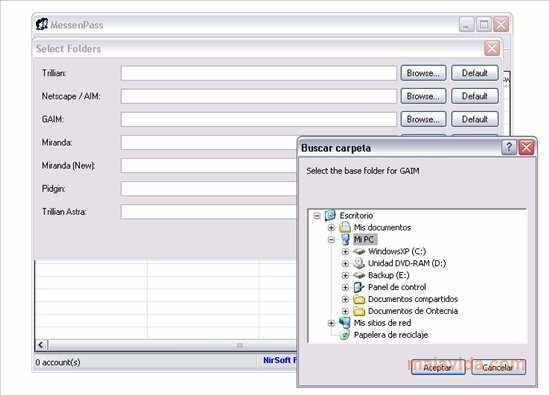 The application allows us to export the information about each account in a text file. Obviously, this tool has as an objective to be able to recover those passwords that we have forgotten and not to be used to spy on anyone. If you want to have a program on your PC with which you can view the passwords used in the instant messenger applications that you have installed, download MessenPass. This program will be detected as a threat by the majority of antivirus applications due to its function.